The Michigan birth injury attorneys at ABC Law Centers understand how complicated it can be to process and understand a diagnosis of hypoxic-ischemic encephalopathy (HIE). Parents are often confused about the potential consequences of this type of neonatal brain damage (including cerebral palsy), as well as whether it could have been prevented with better medical care. Unfortunately, medical malpractice is often a major contributor to HIE and resultant disabilities. If malpractice caused a child’s HIE, they may be eligible for financial compensation to cover past, present, and future medical treatments associated with this condition as well as other lifelong expenses. The decision of whether to pursue a malpractice lawsuit can have a big impact on a child and family’s financial future. Moreover, it is very important to choose the right attorney; HIE cases are very complex, and many attorneys who advertise that they practice this type of law are really not very qualified to do so. Throughout this page, our highly-experienced and focused team of Michigan HIE attorneys will walk you through some advice and guidelines to keep in mind when searching for your lawyer. We’ll cover some of the basic characteristics and attributes you should be on the lookout for, including specific legal focus, medical knowledge, reputation, interpersonal skills, firm practices, and more. Should you have any questions, concerns, or case inquiries as you read through the following guidelines, you may reach out to our legal team. Our attorneys can provide you with a legal consultation, which is free of charge and obligation. Moreover, you would pay nothing throughout the entire legal process unless we win or obtain a favorable settlement. You may call ABC Law Centers toll-free at 866-742-5070, email our team, press the Live Chat tab on your browser screen, or complete this online contact form. We are available to speak with you 24/7. Because birth injury and HIE cases are so specific and complex, it’s critical that you find both an attorney and a law firm that specifically work on cases related to pregnancy, newborns, and birth injury. Finding a lawyer with a specific focus on HIE and birth injury will ensure that he or she has the extensive legal and medical knowledge necessary to fully understand and win your case. The HIE attorneys with the best experience and skill will only advertise for birth injury legal services. If your prospective attorney’s website lists services for auto cases, dog bites, or other unrelated legal services, s/he may not be able to provide you with the depth of skill, experience, and knowledge you’ll need to earn the most from your HIE case. Additionally, make sure your prospective HIE attorney has handled cases related to the relevant obstetrical complications. For instance, if your loved one’s HIE diagnosis resulted from a nuchal cord and delayed emergency C-section, make sure your attorney has handled those particular circumstances in a previous case. Your loved one’s birth injury is undoubtedly specific, and your HIE attorney should accordingly have precise and extensive knowledge. How long has your attorney been practicing? What kind of cases does your attorney handle? Does your attorney win consistently? Does your attorney take challenging cases? Attorneys with more experience in the field of birth injury litigation will have the greatest knowledge and tools to win your HIE case. As you research your prospective attorney’s level of experience, make sure you find their credentials and accomplishments. You should be able to find a list of your prospective HIE attorney’s awards, memberships, and accomplishments on the firm website. Learn as much as you can about these awards and memberships, and compare your prospective attorney’s accomplishments with those of another attorney’s. 4. Does your Michigan attorney assume positions of leadership? Membership in prestigious groups (such as the Birth Trauma Litigation Group, Michigan Association for Justice, and American Association for Justice) is a critical aspect to seek in a Michigan HIE attorney. Furthermore, your prospective attorney should be actively involved in leadership positions offered through these groups and associations. When reading about your birth injury attorney, check to see if he or she has held leadership positions, such as Chair, President, Vice President, Speaker, and Co-Chair. Your prospective HIE attorney’s website should have a page listing information about past cases, verdicts, and settlements. We encourage you to read about their past cases and determine whether or not they specifically and exclusively handle birth injury, birth trauma, and HIE cases. Moreover, you can review the amounts they received for each case. Keep in mind that there are different figures that may be reported in reference to a verdict or settlement, and the numbers on many attorneys’ websites may be inflated. To learn more about how settlement amounts are calculated, click here. On our site, we aim to be as transparent as we can. You will undoubtedly spend quite a bit of time with your Michigan HIE attorney throughout the litigation process. Make sure you get along with your prospective attorney, respect his or her personality traits and attitude, and feel confident in your relationship. We encourage you to specifically ask how your prospective Michigan HIE attorney plans to communicate legal information to you throughout the case. This will ensure you’re never left in the dark. Birth injury and HIE cases are often long, complicated, and emotionally challenging—you’ll not only want a successful attorney, but one who is empathetic, comforting, passionate, and communicative. Hypoxic-ischemic encephalopathy (HIE) cases are legally and medically complex. Before choosing a Michigan HIE attorney to represent your loved one, make sure that s/he works at a law firm that employs a full-time, in-house labor and delivery nurse. This in-house registered nurse will bring valuable new perspectives, experience, knowledge, and insight into cases involving birth injury, fetal oxygen deprivation, and infant brain damage. For instance, Reiter & Walsh’s in-house labor and delivery nurse Andrea Shea reviews medical records, fetal monitoring information, and other critical medical information. She attends important industry events, stays up to date with new scientific findings, and brings a unique expertise to our legal team. It is great when a law firm works with medical consultants outside the office, but it is important to find a law firm that employs a full-time obstetrical nurse specialist in-house. For a lawyer in a highly-specialized field, having a strong network of professional contacts is critical. Make sure your prospective Michigan HIE attorney is a member of important legal groups including the Birth Trauma Litigation Group (BTLG), American Association for Justice (AAJ), and specific state attorney groups (such as the Michigan Association for Justice or MAJ). Attorneys in these prestigious groups have access to important new research, educational practices, and other legal resources. For instance, the BTLG only accepts the most established, leading attorneys in the field of birth trauma. Active BTLG members have access to important information, professional contacts, and legal services. Before hiring an HIE attorney, make sure s/he has a stellar reputation from clients and other legal professionals. You can learn more about your prospective attorney’s reputation by reading client testimonials and looking up his or her awards and memberships. Your prospective attorney’s website should have a clear link to testimonials, verdicts, and settlements. 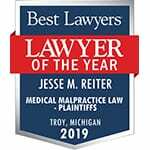 Don’t hesitate to ask your prospective Michigan HIE attorney for access to client testimonials—they are a great way to learn about the attorney’s legal success, personality, and reputation. Additionally, online review companies such as AVVO will list unbiased information about your prospective attorney’s ethics, behavior, and personality. There are a few technical safeguards about firm policy to consider before hiring a birth injury or Michigan HIE attorney. Payment Policies: You’ll want to specifically ask about how your attorney plans to charge you. Make sure that your attorney will not charge you until s/he wins or settles your case. In-House Legal Services: It is important to hire an attorney who will still be involved in your case throughout the legal process. There are some law firms that do not do any birth injury work in house and only refer cases to other firms for a fee. This is a majority of their business and they may not be referring your case to a firm that is capable of handling such a specific topic such as HIE. At ABC Law Centers, we stay involved in your case at every stage. If your case is referred to a different attorney, we will collaborate with the firm and assist with your case as it progresses. You will never be without our firm’s expertise. We encourage you to ask your prospective HIE attorney explicitly about both of these firm policy details. Choosing the right Michigan HIE attorney is the first step towards a life of well-being, rehabilitation, and equal opportunity for your injured loved one. By following these guidelines, we hope you find an HIE lawyer with the compassion, extensive knowledge, and experience to not only win your case, but to make the legal process a time of comfort, empowerment, and ease. At ABC Law Centers, our passionate and highly experienced Michigan HIE attorneys fight tirelessly for children harmed by medical malpractice every day. We focus exclusively on birth injury cases and have the specific knowledge necessary to win cases related to hypoxic-ischemic encephalopathy (HIE), cerebral palsy, and other disabilities.